Heather is a jewelry designer, artist and entrepreneur, who began making jewelry in 2008, and has been selling online to customers around the world since 2009. 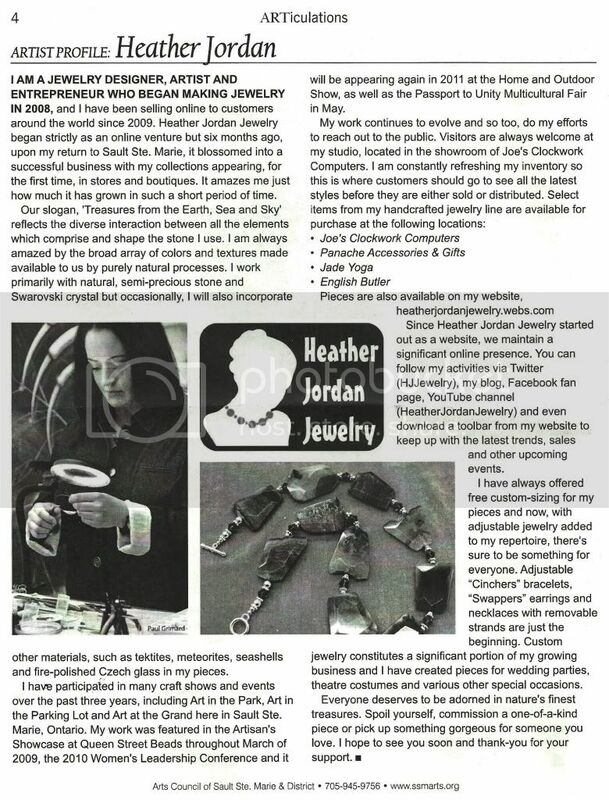 In 2011 Heather Jordan Jewelry was officially established as a small business in Sault Ste. Marie, Ontario. Heather has participated in many craft shows and exhibits, in Sault Ste. Marie, Ontario/Michigan, Toronto, Ontario and Hamilton, Ontario. Her work was featured in the Artisan’s Showcase at Queen Street Beads throughout March of 2009, the Sault Star and in the March 2011 issue of ARTiculations. In 2013, Heather Jordan Jewelry re-located to Toronto, Ontario and has been there ever since. Heather's entry into the artisan jewelry world was a slow and gradual process. Following years of formal education in molecular biology, geoscience and astrobiology, she abandoned her chosen career in scientific research to pursue jewelry. Heather is a self-taught jewelry artist who received no formal training in art or business. She began making jewelry as a hobby in 2008 and gradually built her business solely from the sale of her pieces, launching Heather Jordan Jewelry officially as a small business in 2011. Her pieces are currently being worn by thousands of customers in 48 countries (on 6 continents!) around the world. "Heather Jordan Jewelry has very humble roots. I started making jewelry as a way to cope with what was going on in my personal life. After years of persistent illness, I was granted a second chance to have a career; something so many others, in my situation, don't receive. I never purposefully set out to start a jewelry business; it just seemed to unfold naturally as time went on. My first pieces were bracelets made with packets of stone chip beads from the local dollar store. I was able to sell them and use the proceeds to buy simple tools and materials from local craft stores. Again, pieces sold and I used those profits to buy even more supplies. The cycle continued. A friend offered display space in her store so I would have a place to sell full-time and I started doing local craft shows. Soon, I was outselling competitors and being approached by owners of local boutiques, who were interested in carrying my work on consignment. Next, I ventured out into online venues. By then, I had acquired a taste for being my own boss and wanted to see if I could build a real business. I started working with wire just before I got my business license. Since no other local artists were wire-wrapping, it helped me stand out. I also felt that using manufactured components often resulted in pieces that lacked character and realized that if I made my own findings and elements, I could create pieces that differed significantly from anything else on the market. I also had more creative freedom since wire-wrapping gave me the ability to use materials that would otherwise be off-limits for use in strung (beaded) jewelry, such as un-drilled stones, fossils and meteorites. Entrepreneurship is far more challenging than most people think, especially if you don't have a start-up fund to launch your business, and you're accustomed to traditional employment. Not only did I have to develop my skills as an artist, but a businesswoman as well."